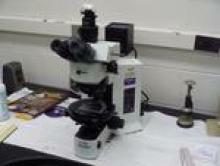 Using reflected or transmitted light, this microscope produces excellent images which may be recorded using our Olympus digital camera. We have objectives for longer working distances, for samples under a coverslip or without a coverslip. The stage rotates, which is useful when using the crossed polarization mode i.e. for the observation of geological thin sections.